The 3140 mAh is undoubtedly the best i've ever seen. I like this phablet..... from its design, power, screen size, display, micro sd card slot to removable battery. HTC One CAN'T even come close to G PRO!!! why is that so? and how can i fix it? AnonD-90736, 01 Mar 2013Are you sure, the lg pro beats the htc one in all the benchmarks bar one, there is only one wi... moreNo. This cheap crappy LG phone with the copycat design never even come close to HTC One. I'll stick to my HTC. AnonD-58567, 01 Mar 2013You are wrong dude.... Just go and use note 2 for once.... You will not say this again... D... morenote2 is nothing in front of g pro. interms of design g pro is more elegant good looking phone. Note2 is nothing compare to G pro. You should accept that lg has followed samsung from beginning of the.android.. I love samsung and lg..
To be perfectly honest the L G optimus G is certainly boasting some impressive jaw dropping figures and i'm in the market for a new smartphone anyway. Why not all synthetic benchmark include new HTC One? Snapdragon 800 or GTFO, for a 5+ inch 1080p phablet this is totally underwhelming, but I guess the lesser of the two Korean conglomerates can't match their rivals' prowess/vision in this highly competitive market ! AnonD-88295, 01 Mar 2013Did I miss something .. 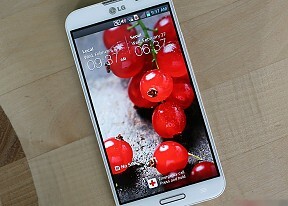 But are there new features introduced by the LG Optimus G Pro? Specs a... moreThey should used 3D screen! Anonymous, 28 Feb 2013Great phone. But it won't be able to compete with HTC One. Are you sure, the lg pro beats the htc one in all the benchmarks bar one, there is only one winner and its certainly not the htc one. Also it has a bigger and nice looking screen. It's funny approach that GSMArena choosen to compare the LG Optimus G Pro 5.5" screen with Samsung Galaxy SIII 4.8" and not the Galaxy Note II 5.5"... Why not compare it to iphone5, 4S or even smaller screen phones?